The Additional Director General of Police, at the instance of the Punjab State Human Rights Commission, has recommended registration of cases against certain employees of the Civil Surgeon office here for dereliction of duty and tampering with the records of an employee, Sukhwinder Singh, to harass him for exposing the infamous medical scam in the district. The Ludhiana Vigilance Bureau has traced property worth about Rs 90 lakh of Inspector Shamsher Singh Guddu, who was booked by the bureau under the Prevention of Corruption Act, for possessing assets disproportionate to his known sources of income, two days ago. “Shaheedoon ki chitaoon pe lagen gey har baras mele, wattan par marne walon ka yehi baki nishan hoga”. Regretfully this no longer seems to hold true today. Thanks to the callous apathy of the people in general and the powers that be in particular. A sting operation by sleuths of the CBI stretched over several days led to the arrest of the Income Tax Commissioner (appeals) M.L. Dhussa while taking a bribe of Rs 6.5 lakh from one of the aggrieved parties in his office last evening. He has been detained by CBI officials. However, it could not be ascertained as to where he was taken after his arrest. 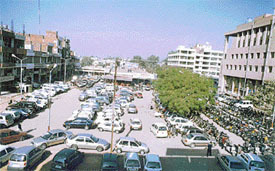 The shopkeepers of Feroze Gandhi Market here are up in arms against the numerous car dealers, who they allege, have encroached upon more than 70 per cent of the open areas of the prestigious market, turning it into a car bazaar besides creating severe parking problems and affecting their businesses. Even as cops here have started challaning women drivers and pillion riders without a helmet following directions of the High Court, activists of the Sarb Hind Shiromani Akali Dal (SHSAD) have decided to oppose the move, especially for Sikh women, on the plea that it was against Sikh tenets and principles. Several of the city’s notorious offenders are allegedly having a gala time as they continue to trade in stolen goods in connivance of the city police. A number of cases, including those of theft are registered everyday at various police stations of the city, but rarely is a case registered against these offenders. An impressive rally was held by the Punjab State Pensioners Mahasangh in front of the Tehsil Courts here today. In spite of freezing cold, a large number of pensioners thronged the venue from all over the state. 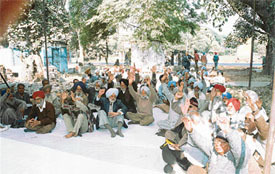 Pensioners at a rally organised by the Punjab State Pensioners Mahasangh in front of the Tehsil Courts in Samrala on Thursday. ‘The Congress Government in Punjab, committed to the welfare of weaker sections and several measures have been initiated towards this direction. This was stated by Mr Mohinder Singh Kalyan, chairman of the SC/ST cell of the Punjab Pradesh Congress Committee, while addressing a function organised by the district SC/ST cell at Haibowal here today. The Sultan-ul-Qaum Jassa Singh Ahluwalia award for the welfare of the community has been posthumously awarded to Dr Inderjit Singh, founder of Punjab and Sind Bank and the Bank of Punjab, by the Gurmat Gian Trust, Ludhiana, at a function held here. The awards were handed out by the “panj piaras”. A discourse on “Living values — dire need of hour” was held here last evening by Prajapita Brahma Kumaris Ishwariya Vishwavidyalaya. During the discourse, decline in individual qualities like human values and ethics were discussed. Mr Gurcharan Singh Tohra, former president SGPC, underwent heart bypass surgery at Batra Hospital, Delhi, yesterday. The surgery was performed by Dr T.S. Mahant, Chief Thoracic Surgeon, and Dr Upinder Kaur, Chief Cardiologist, of the hospital. The Basti Jodhewal police has registered a case under sections 363 and 366 of the IPC against a migrant from Bihar for allegedly kidnapping a minor girl living in Hira Nagar. Ludhiana police chief Harpreet Singh Sidhu today claimed in a press note that the police had succeeded in nabbing 1030 proclaimed offenders during this year. According to the SSP, these POs were arrested by the newly constituted PO cell. Many among then were migrants. Two Punjab farmers — Mr Mohinder Singh Grewal of Kanganwal village in Ludhiana district and Mr Sukhpal Singh Bhullar of Ghuman Kalan village in Bathinda district — will be honoured by the Central Government at a function in New Delhi on December 22. A state-level inter-college and inter-school article/feature writing contest, “Reflection-2002” was organised by the Guru Nanak Institute of Management and Technology, Gujarkhan Campus, Model Town, here. The topics ranged from professionalism and education to communication and technology. The Directorate of Extension Education, PAU, will organise a three-month training course in Integrated Agriculture for young farmers from January 6 to April 5. Matriculate farmers in the age group of 20-40 years are eligible for enrolment. 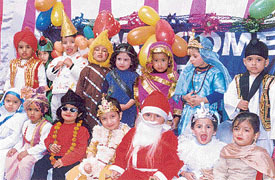 Tiny tots of Prime-Rose Nursery School here participated in the school’s annual fancy dress competition. The contest began with a solo performance by kids clad in eye-catching dresses. The students were full of joy and confidence. Children during the annual fancy dress competition at Prime Rose School in Ludhiana on Thursday. Sparkle Nursery School here celebrated Christmas in a very special way. The Christmas celebrations were merged with winter festival. In a story starting with the birth of Jesus Christ, followed by a session of snowfall, the celebration ended up with the singing of X’mas carols and a feast for the kids. The Sur-tal competition organised by the state government to promote Punjabi culture and tradition, got underway this morning at Ramgarhia College. Ms Harmmet Kaur, Principal of Ramgarhia Girls College, said the selection of non-professionals had been done in the morning. The competitions between the college students will start at 10 am tomorrow. The annual prize distribution function of S N Public High School, Indra Puri, Ludhiana, was held today. Mr H.S. Chawla zonal in charge, S.N. Mandal, presided over the function which started with the hymn,” Toon datar in sabh ton vadda ki koi sift krey sarkar...” A cultural show was presented by students. Preparations for the District Bar Association elections, scheduled to be held tomorrow, have been completed. A total of 1,473 voters will decide the fate of 24 candidates contesting for 15 posts. According to Mr Jaspal Chugh, Returning Officer, the elections will start at 9.30 a.m. and conclude at 4.30 p.m.
A two-day national orientation module for optometrists is being held at the Vocational Rehabilitation Training Centre, (VRTC), Haibowal, in collaboration with the National Institute for Visually Handicapped (NIVH) Dehra Dun. Twenty optometrists from various parts of India are participating. Some of them are from government institutes while some are private practitioners. Ludhiana Central Co-Operative Bank Limited, Khanna, had served a legal notice for the payment of loan to the accountant of Khanna Municipal Council, Mr Ashok Kumar, posted at Mandi Gobindgarh at present, for the outstanding amount of Rs 35,734 plus interest.